Perfect location - at the corner of Four O'Clock Road and Park Avenue - Park Place Condominium is one block from Main Street on the slope side of town, and only 800 feet (two blocks) from the Snowflake Lift. You can literally walk anywhere - Downtown restaurants, shops, clubs, and taverns, as well as the Ski Lift. If you don't want to walk, you can take the FREE local town shuttle bus - pickup is across the street. Just park at the condo and put your keys away - you won't need to drive! This spacious unit is approximately 1100 square feet, and contains two bedrooms and two baths arranged in two private suites. The layout of this unit is a great setup for multiple families sharing the unit, or larger families. The private deck with gas grill overlooks the two on-site hot tubs. There is a new indoor/outdoor shared pool. Free WiFi included, 42-inch LCD HDTV in the living room, 32-inch LCD TV's in each bedroom, and covered parking is available at no additional charge. Hi! We are the Hagans. We love the mountains and love to ski. We hope you enjoy our condo. We chose Breckenridge because of its charm and proximity to everything we love to do, ski, hike and bike. Four O'Clock Run is just across the street. Smooth top range, Dishwasher, Coffee Maker, Microwave, all the pots and pans you need. Well equipped and recently renovated. Comcast Cable with some HD channels. 42' LCD HDTV in living room, and 32' LCD HDTV in each bedroom. Very nice, Large balcony that overlooks hot tub area with gas grill. The condo is quite nice. It is utilitarian without many luxuries, but suits the needs fine. It is a 500 foot walk to the bus that takes you to the lifts. The wait is never long. You can walk into town. The condo was in good shape. I wished it had coffee filters for the coffee machine. I would stay again. Good location. Very convenient to town. A bit of a walk up to snowflake lift to start the ski day. Love the steam shower apres ski. Hot tub just a few steps from the condo. I would recommend this condo. Really enjoyed our stay. I stayed here with a group of friends. The location is literally 1 block from the end of a trail and 2-3 blocks from Snowflake Lift. It was also just across the street from the village and took minutes to walk everywhere, but there are several shuttle stops close by for those not interested in walking. The complex was quiet and would be a great place for a family or friend trip. Would love to stay when we come back. 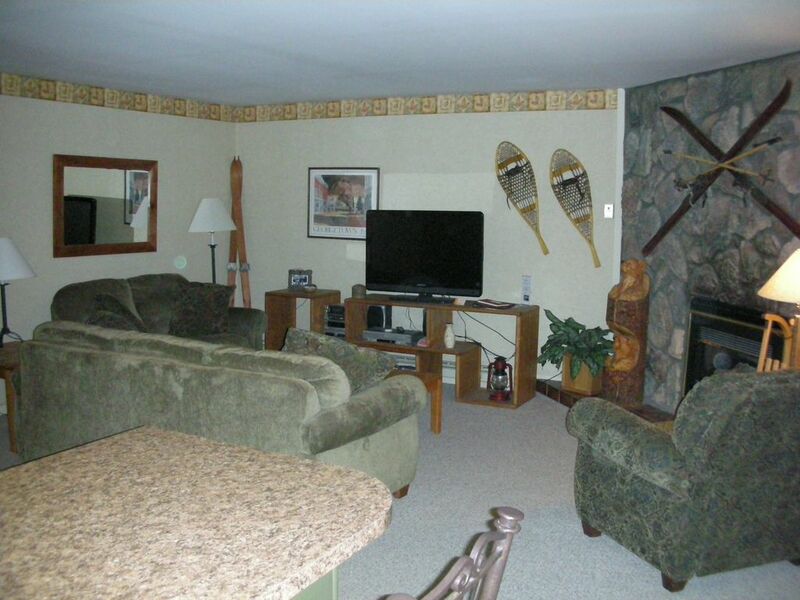 Our 6 person family greatly enjoyed our 8-day stay in this 2 bedroom, comfortable, spacious, and well-maintained condo. Walk across the street to the free ski lift shuttle bus, or 5 minute walk to Main St. in town, or the Village shopping and restaurant area. Everything worked great including kitchen appliances, plenty of hot water, space heat and Smart TV. Close to the hot tubs. One short flight of stairs up from entrance. Owners communicate promptly and were very helpful with all my questions and needs. Recommend highly. we enjoyed our stay here. conveniently located. Clean. well equipped. Small suggestion would be for higher wattage lights in the living room. Would definitely recommend. Comfortable condo and great location. Nice layout, very comfortable and was roomier than what the pictures suggested. Cancellation Policy: If cancellation occurs up to 30 days prior to arrival, we will refund any payments less one nights lodging. Cancellations within 30 days will result in forfeiture of all payments made.